What is the Currency of Saint Kitts and Nevis? The official currency of Saints Kitts and Nevis is the East Caribbean dollar. The Eastern Caribbean Dollar is the official currency in member states of the Organization of Eastern Caribbean States which include Saint Kitts and Nevis. The currency is codified as XCD in international money markets and is abbreviated as $ (or EC$). The currency was introduced in 1965 as a replacement to the British West Indies Dollar. The Eastern Caribbean Dollar is made of 100 subunits known as cents and has been pegged to the US Dollar since 1976 at the rate of 1 US$ to 2.70 EC$. 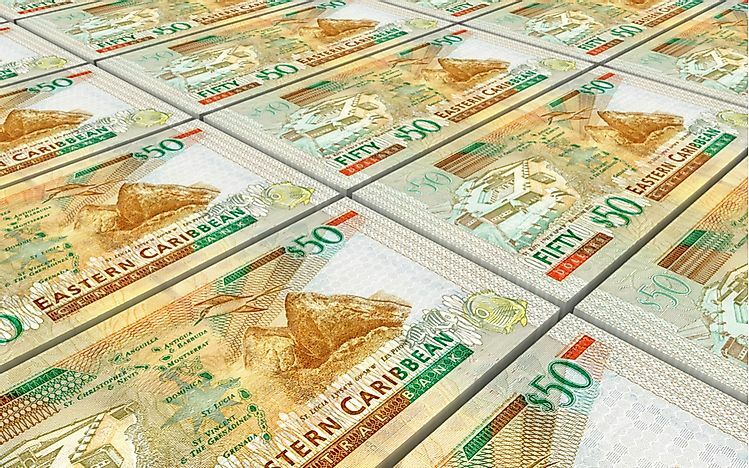 The issuance of the Eastern Caribbean Dollar is conducted by the Eastern Caribbean Central Bank which issues the currency in coinage as well as banknotes with the lowest denomination being the 5-cent coin and the highest being the 100-dollar banknote. The country has had other currencies circulation over its history and includes the Eight Royal Coins, the Saint Kitts Dollar, and the British West Indies Dollar. The Spanish Dollar was the official currency of the Spanish Empire which circulated all over the world in the 17th and 18th century. Also known as the “Eight Royal Coins”, the currency was adopted in the West Indies (which included Saint Kitts and Nevis) as the legal tender due to its unique milling characteristics as well as its uniformity in standard. The Eight Royal Coins was issued in coinage and continued being used in circulation on the islands until the late 19th century. The Kingdom of Great Britain gained control of the islands of Saint Kitts and Nevis with the signing of the Treaty of Utrecht in 1713 in the aftermath of the War of Spanish Succession where the British won at the expense of the French. The British Empire through Her Majesty, Queen Anne proclaimed the establishment of the gold standard in 1701 in the West Indies. However, it took about 150 years for Saint Kitts and Nevis to adopt the sterling currency (Saint Kitts adopted in 1849 while Nevis adopted in 1858). The Saint Kitts Dollar was made of subunits known as bits where one dollar was equivalent to 12 bits and each bit was worth 9 pence. The colonial power issued the Saint Kitts Dollar in coinage where the currency was minted in half, quarter, and eighth-dollar coins. Dollar-denominated private banknotes were issued in 1913 and were later reissued in 1920. The Saint Kitts Dollar was replaced by the British West Indies Dollar in 1935. The British colonial power introduced the British West Indies Dollar as the official currency used in its Caribbean colonies including Saint Kitts and Nevis. The currency was adopted in the islands in 1935 and replaced the Saint Kitts Dollar after the Saint Kitts Dollar was affected by the 1873 global silver crisis which led to the demonetization of silver coins. The issuance of the British West Indies Dollar was regulated by the British Caribbean Currency Board based in Trinidad. The British Caribbean Currency Board was later replaced by the East Caribbean Currency Authority in 1965 after Trinidad and Tobago withdrew from the economic body and set up its own central bank. The currency was pegged to the Sterling Pound at the rate of 1 pound to 4.8 dollars. The British West Indies Dollar was primarily issued in coinage of a half-cent, one, two, five, ten, twenty, and fifty denominations with the obverse of all coins bearing the likeness of Her Majesty, Queen Elizabeth II. What Are The Major Natural Resources Of Saint Kitts And Nevis? What is the Currency of Saint Lucia?